Monetarism began it’s rise to world prominence in the ever-conservative Bundesbank in 1974. But it would be the government of Margaret Thatcher in the UK, elected in 1979, that would truly launch monetarism in central banking. After Thatcher’s monetarist experiment undertaken between 1979 and 1984 every economics student would be taught to recite the various monetary aggregates by heart for at least a decade or two. This is what accounts for the monetarist bent we see in the economists of the last generation. Basically any economist trained between roughly 1980 and 1995 would be heavily exposed to monetarist dogma. And only those that read alternative accounts of money creation — namely, the theory of endogenous money — would be fully immunised. This explains, for example, why certain economists that champion Keynesian policies — like Paul Krugman — actually speak in monetarist tones. But it was the Labour government of James Callaghan that paved the way for the monetarist dogma. The short version of the story runs something like this: in 1976 Callaghan needed a $3.9bn loan from the IMF because he was concerned that the value of the sterling was about to crash. The IMF insisted that Callaghan undertake austerity policies and that he establish a monetary target for the central bank. This is how monetarism entered the UK. As shorthand this is pretty much accurate. But to understand the history in more depth we must consider the role of the financial markets and the financial press — two institutions that had been ‘converted’ to monetarist dogma pretty much the moment the sustained inflation of the 1970s broke out. In order to explore this I will draw on an excellent paper by Aled Davies entitled The Evolution of British Monetarism 1968-1979. 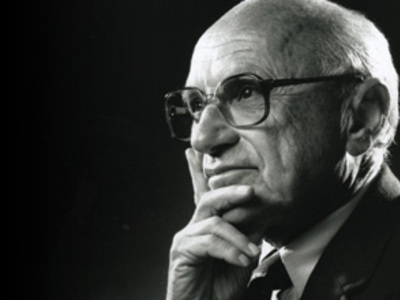 The debate surrounding monetarism began in 1968 when journalists in Britain and the US began to pay attention to Milton Friedman. This was partly because of Friedman’s communicative abilities but it was also partly because of the inflationary pressures that were beginning to build in the world economy at that time — mostly due to trade union entrenchment, upward movements in commodity prices and large deficits in the US to finance the Vietnam War. Even at this stage institutions like the OECD and the IMF were paying attention. By the time the inflation in the UK had taken off due to the first oil price hike in 1973-1974 some of these commentators were writing letters to Prime Minister Harold Wilson saying that if he didn’t balance the government budget the UK would fall into the abyss of a hyperinflation. This was complete nonsense, of course, because the inflation wasn’t due to an unbalanced government budget at all. Rather it was due to the rising price of oil and the wage-price spiral that accompanied it. But the City of London, unfortunately, was on the side of the hyperinflationists even though the Treasury Department remained unconvinced. The Chancellor of the Exchequer Denis Healey, however, took the monetarist critique and turned it into his own: he alleged that the monetarists were correct in their diagnosis and that the imbalanced budget had been the result of the previous Conservative government’s misguided fiscal stimulus programs. Talk about giving them the rope that they would eventually hang you with! By 1976, with inflation raging and monetarism important because of the very fact that it was believed, the government felt the sterling to be faltering. They were concerned about a massive speculative attack that would crash the currency and send inflation skyward. It was at this point that the Callaghan government approached the IMF for a loan. The Treasury hated the idea, but the Callaghan government felt compelled to accept it. And with that the government had trapped itself. By positing the need for a target without the intention of seriously pursuing it they had sealed their fate. They could now be chastised for not meeting a target which was, as those working in the Treasury at the time knew well, impossible to meet because the money supply was impossible to control (i.e. it was endogenous and determined by other variables). In 1979 Thatcher would rise to power with full intentions to meet the targets she set, no matter what the cost. The fact that she failed spectacularly and monetarism was thrown in the dustbin after 1984 was of secondary importance; the dogma had done it’s job — it had justified the demolition of British manufacturing and the gutting of trade unions — and anyone exposed to economic ideas in this era was forever infected. So, what can we learn from all this today? Well, certainly that the finance sector has a remarkable ability to spread ideas which become important simply for the fact that they are believed. Unfortunately, however, financiers have a very immediate and obvious interest in seeing the government tackle inflation — as it eats into their earnings — but they have no very immediate and clear incentive to have the government reflate the economy. Nevertheless, it is clear that most of the financial community are coming around to Keynesian-ish ideas today and for those of us who want to see those sorts of policies enacted that cannot be a bad thing at all. Apart from that I think that there is much of aesthetic interest in the monetarist saga; if nothing else it shows us just what a hall of mirrors we live in, with ideas taking on a life of their own through the simple act of people pretending to take them seriously. About a year and a half ago I wrote a three-part series on monetarism which I published on Naked Capitalism. It might be of interest to readers so I include links below. It wasn’t the IMF loan that was the problem. It was agreeing a US dollar loan with the US in June 1976 that sunk the UK. A sovereign borrowing in a foreign currency is a no-no – the original sin if you like. Monetarism was one half of the problem. The other half was a bunch of people still operating as though Bretton Woods still existed. Old knowledge is a dangerous thing. ‘Runs’ on currencies in a floating rate system can only really happen if there is a patsy taking the other side trying to defend a peg either by intervention or with interest rates. As Mike Norman points out without that the speculators are just fighting amongst themselves. Simon London, “Lunch with the FT – Milton Friedman,” Financial Times (7 June 2003). I heard Aled Davies present this project in Oxford about a year ago. Nice to see that it turned out well. He had a nice PP-presentation so he must be onto something good… He also claimed Arsenal would end up top 4 in the Premier League, something I questioned. He was right of course… Must be a smart lad. Anyhow, I should get to the point. As you mentioned the conservative Bundesbank in the beginning, i came to think of another presentation I heard during the same time. A fellow Dphil student of Davies (but one or two years behind), Simon Mee, had plans to try to dig into the origins of the Bundesbank’s conservative ideas. References to the bankers experiences as young men during the hyper-inflation seems to be the dominant and public explanation for their stance against inflation. I don’t think he has published anything yet, but financial history is not really my field so I might have missed it. If you hear about that latter paper please let me know. I am very interested in what this group are doing and I am going to contact Davies tomorrow. I am sure you are aware that Bill Mitchell is writing a new book on Options for Europe? He has has been posting bits and pieces of various chapters on on his blog. In one of these, he talks about the fall under the sway of monetarism by uk and other European finance and central bankers in the lead up to the single currency. It would sure be helpful for him to pick up these details about the UK turn towards monetarism/Friedmanism, which I did not know, and had not seen in his snippets posted on this period. Don’t know what your relationship is with prof Mitchell, but maybe some footnoting or cross referencing is possible? For those of us anxious to purchase this new book, the more inciteful and detailed, IMO the better. By the way, I live in Dublin (although do a lot of work in London) and would enjoy meeting you if you are ever around? Hmmm… I’ll look into that. Thanks. Yes, sure. I’ll drop you an email.